In the BMA’s Berman Textile Gallery, Patterson creates an immersive installation featuring her work …and babies too… (2016-2018)—a memorial to children killed in violent crimes. Elevated to waist-height, the glittering tapestry loaded with symbols of childhood is accompanied by 18 pairs of cast glass shoes, faux butterflies, and papier-mâché balloons in a plush pink environment. 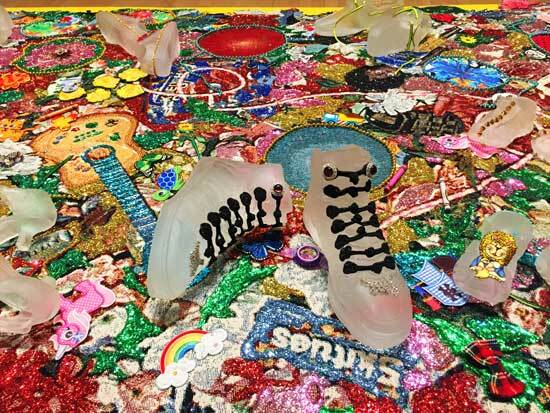 Ebony G. Patterson's immersive installation in the Berman Textile gallery memorializes children killed in violent crimes, while asking what it means that society treats some bodies as valuable and others as expendable.